Photo of the Goderich Lightstation in the backdrop of a sign for the lightstation, Ontario, Canada, North America. 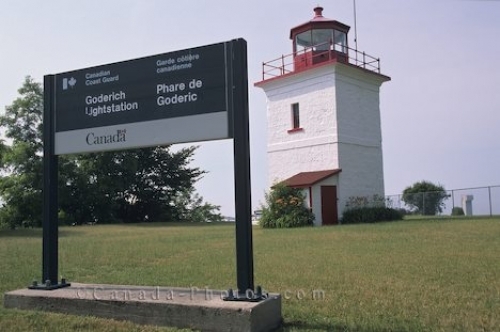 In the foreground is a large black sign with white lettering in English and French advertising the Goderich Lightstation. The sign is mounted to two posts which is bolted to a slab of concrete. Just beyond the sign is a well maintained green lawn that leads to the lightstation. The lightstation is a square brick building which is painted white and trimmed in red. A red door is the entrance into the station leading to the red dome protecting the lamp.